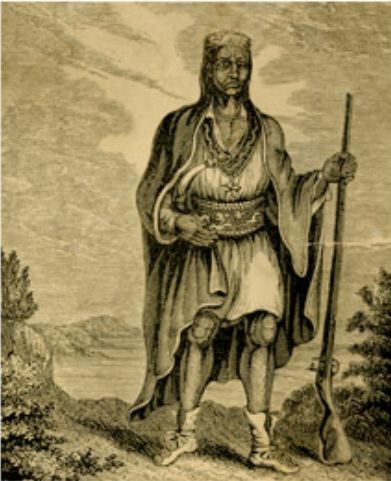 August 12 is the anniversary of the death of the Wampanoag sachem Metacom, also known as Metacomet or King Philip,the name given to him by the English. His death in 1676 essentially ended King Philip’s War, a violent and bloody conflict between the Wampanoag and English colonists. While most of the fighting took place in Rhode Island and Massachusetts, people from Connecticut took part in the many of the battles and had an important influence on the outcome of the war. The underlying cause of the war was the colonists unrelenting desire for more and more land, but the immediate cause for its outbreak was the trial and execution of three of Metacom’s men by the colonists. Metacom and his men began attacking and destroying English settlements and kidnapping and killing English settlers. For a while, it looked like the colonists might have to abandon the frontier and withdraw into a handful of fortified seaside towns. Connecticut troops, together with members of the Pequot and Mohegan tribes who served as an auxiliary force with the Connecticut militia, played a prominent role in the Great Swamp Fight, near South Kingston, Rhode Island, in December 1675. Fearing that the Narragansett tribe was going to join with Metacom, the colonists, including five companies from Connecticut, marched through freezing conditions to attack the Narragansett camp, a fortified village of five acres housing about 1,000 men, women, and children. After hours of battle, the colonists gained control of the fort and burned all wigwams. Nearly all of the inhabitants died including women, children, and elders. Skirmishes and massacres continued into the spring of 1676. Metacom’s men attacked Simsbury on March 26. According to legend, Metacom sat in a cave on Avon Mountain and watched the burning of the town. Other attacks that spring took place at Plymouth and Longmeadow, Massachusetts. Providence, Rhode Island, was burned on March 29. But by summer, Metacom’s support was beginning to melt away. 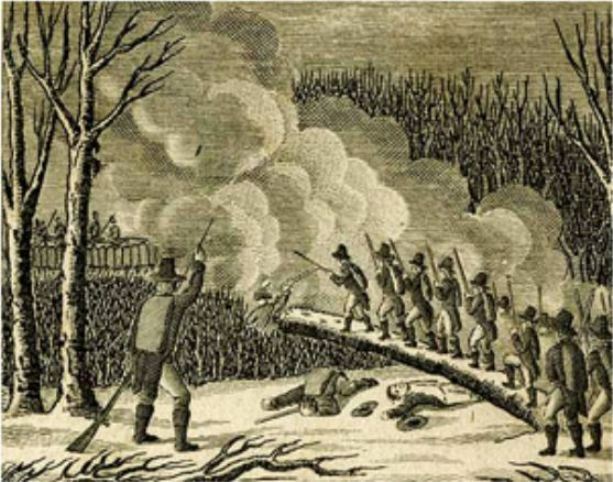 In June, Connecticut troops repelled an attack on Hadley, Massachusetts, and Major John Talcott of Simsbury began capturing large numbers of Metacom’s followers, transporting them from New England, and selling them as slaves. Captain Benjamin Church pursued Metacom to a hiding place in Mount Hope, Rhode Island, where he was killed on August 12. King Philip’s War has been called United States’ most devastating conflict. One in 10 soldiers on both sides was killed, 1,200 colonists’ homes were burned, and vast stores of foodstuffs destroyed. The effects of the carnage and property damage were felt for years by colonists. The war’s ramifications for Native populations of southern New England included not only loss of life and, for some, enslavement but the continued erosion of sovereignty, land rights, and communities as well. Leach, Douglas Edward. Flintlock and Tomahawk; New England in King Philip’s War. New York, NY: Macmillan, 1958.